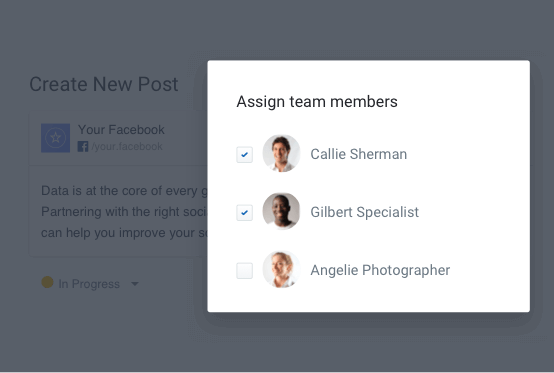 Streamline your community management workflow by setting up teams, roles, and permissions. Easily understand how your brand is perceived by others and report on your customer care efficiency to build a loyal, engaged community around your business. Improve the organization and efficiency of your team by defining clear roles and responsibilities. Stay on top of your teams' activity by overseeing their work using feeds and labels. Get automatic notifications on the most important community performance indicators and respond immediately. Easily assign roles and responsibilities to set your team up for success. Streamline your processes and clearly define tasks so everyone on your team is aligned on expectations. 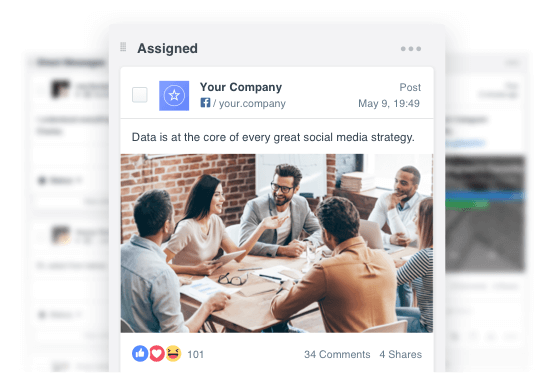 Keep an eye on all your team work with feeds you can filter by label, competition, assignment, post grade, and more. Never miss a comment, or post from your community with automatic notifications. Assign posts for approval to reduce errors, save time, and work more efficiently. Provide on-point customer care across platforms in a single convenient spot. Analyze your direct messages and monitor your customer service activities with up-to-date reports and Salesforce integration to keep a high standard of customer communication. Address questions and comments your customers posted across channels in one convenient interface. Save time and respond promptly without having to switch between platforms. Monitor all your incoming and outgoing direct messages. Streamline your customer service activities with Salesforce integration. 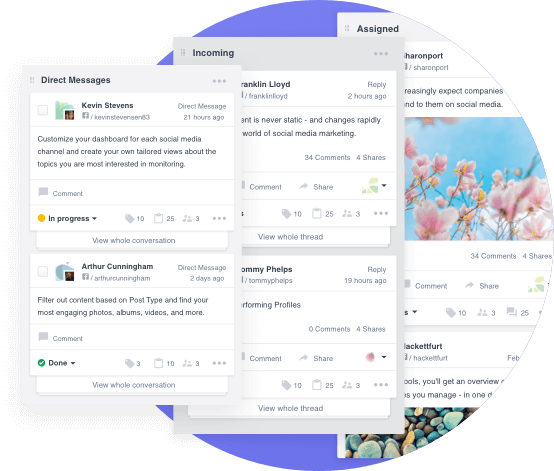 Improve your customer care workflow by adding statuses, responsible team members, labels and internal notes to your messages. Automate the way you analyze messages and comments you receive from your audience. Easily create custom rule-based labels and have all your incoming communication automatically tagged and analyzed to spot common themes and respond appropriately. Measure your average response time to ensure the quality of your messaging is consistently high. Understand every element of how you interact with your community and identify gaps in your process that could be improved using ready-made reports. Understand conversations around your brand happening on Facebook and Twitter. Monitor topics discussed by your audience and always give timely, fitting responses. Automate your reporting, strengthen brand affinity, improve customer relationships, and spot potential crises before they spread. 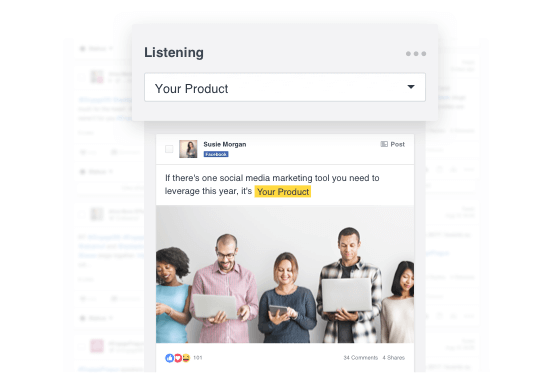 Discover topics your audiences are talking about by monitoring keywords of your choice across Facebook and Twitter. See the most relevant discussions by filtering the conversations by topic, query, country or language, and understand how they evolve over time. Find out who are the influencers that speak in your favor. Track how their conversations affect engagement and work with them to reach their audiences. Take a closer look at the way your community is interacting with your Page by seeing who mentioned a given keyword most frequently. Know how your community members perceive your brand across social media channels. Deliver better care to your customers by automating the tedious task of labeling posts individually. See the intent behind every post and use this intel to develop a meaningful response. Simplify your analysis with a visual illustration of post sentiment. 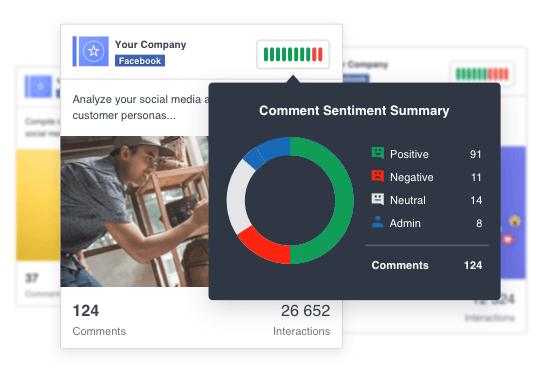 Better understand and report on your community's emotions in a click. Compare the sentiment of your campaigns side-by-side. Take a data-driven approach to your content strategy by learning what's clicking with your audiences and what's not. Filter through your posts by positive, negative and neutral sentiment to see which content is resonating with your audiences the most. Use your insights to create even better content to keep your community engaged in the long run. Get a bird's eye view of how your global teams are performing across platforms with comprehensive community dashboards. Customize reporting and track statistics that matter to your business with ease. With an easy-to-use interface you can get your team up and running smoothly and reduce time spent on onboarding. 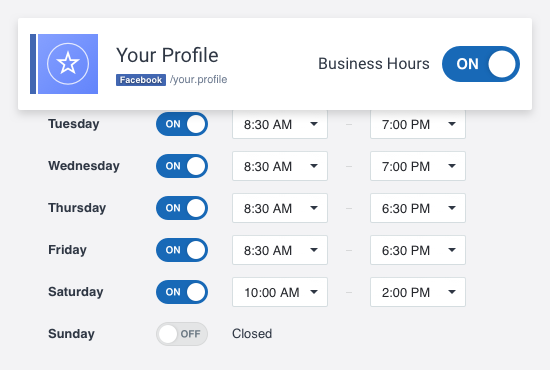 Get an accurate view of how your teams are performing with the ability to set up business hours and holidays. Know how quickly your teams are responding to your community by limiting your analysis to your operational hours. Know how your international teams are performing with a comprehensive community dashboard. See where you excel and zero in on areas that need to be strengthened at a glance. Limit the time it takes to onboard your teams with an easy-to-use interface. Phase out unnecessary communication channels and keep global teams on the same page with built-in internal notes.